Children's story written by David Walliams. Recently adapted for theatre. "David Walliams' bestselling children's book, THE MIDNIGHT GANG, is a story of friendship, theatre and magic - and of making dreams come true. 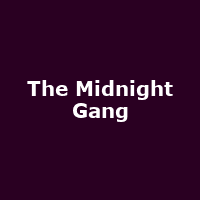 When the clock strikes midnight most children are fast asleep, but for the Midnight Gang the journey is just beginning. This extraordinary story of five children in a wonderfully inventive and eccentric hospital setting promises to take fans from around the globe on an unmissable midnight adventure."